Designed for a dynamic lifestyle, the Women's Circuit Mesh Swim Top- Boca Chica caters to adventurists both in and out of the water. Whether it's a morning workout or a paddleboarding excursion, the BMBC7AHH features the ultimate blend of comfort and function. 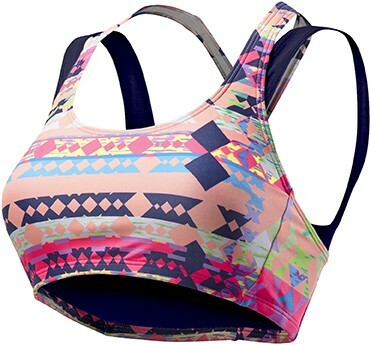 With classic coverage and removable cups, this aquatic sports bra is inspired by women who aren't afraid to sweat it out. 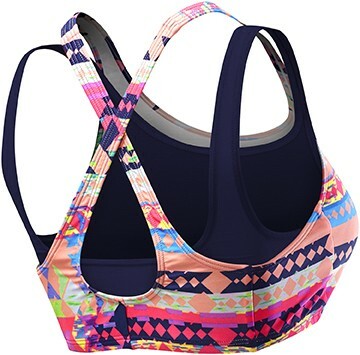 A dual layer construction of both mesh underlay and vibrant print combine criss-crossing and traditional straps for added support. Created with UPF 50+ technology, the fully lined BMBC7AHH Top ensures sun safety for every outdoor activity. Great fit! Mesh lining doesn't stretch giving top a tighter/smaller fit. When I bought this suit, I did not know there was a mesh built in bra. The suit straps criss cross in the back, and the mesh built in bra does not. It looks silly, and would leave weird looking tan lines. I cut the bra out and it looks much better now.